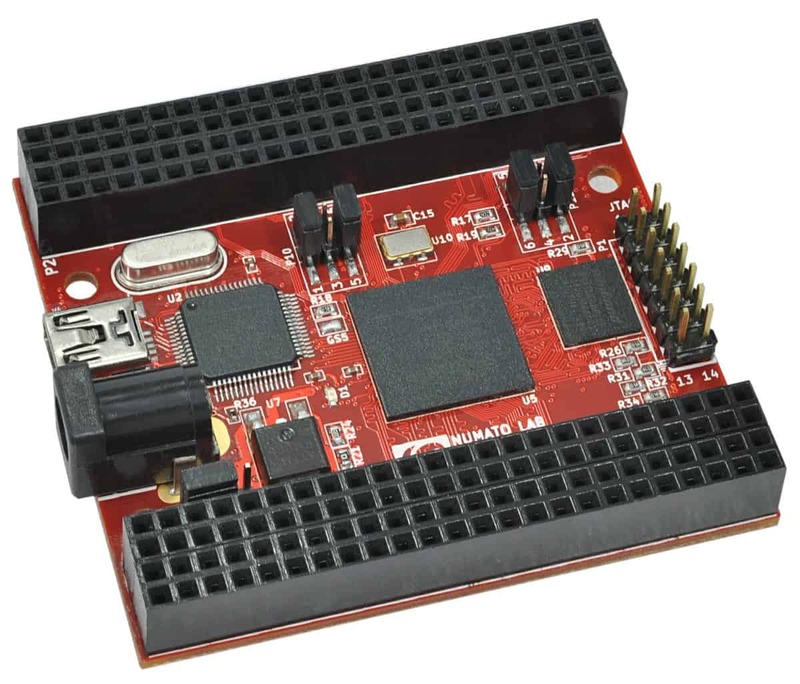 Saturn is an easy to use FPGA Development board featuring Xilinx Spartan-6 FPGA. Saturn is specially designed for experimenting and learning system design with FPGAs. This development board features Xilinx XC6SLX series FPGA with FTDI’s FT2232H Dual-Channel USB device. 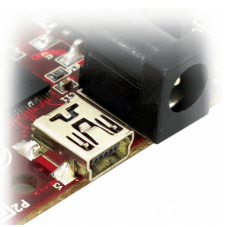 The high speed USB 2.0 interface provides fast and easy configuration download to the on-board SPI flash. No programmer or special downloader cable is needed to download the bit stream to the board. the end of this document. Details of individual connectors are as below. 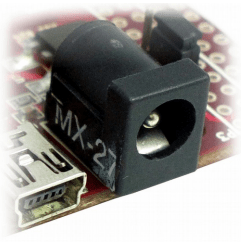 The on board full speed USB controller helps a PC/Linux/Mac computer to communicate with this module. Use a USB A to Mini B cable to connect with a PC. By default the module is powered from USB so make sure not to overcrowd unpowered USB hubs (the picture on the right shows USB Mini connector). The Power Select header K1 is used to configure the power source for the board. The jumper in pin 2 and 3 is shorted to switch the power source to on board USB port and pin 1 and 2 to use the external DC power. 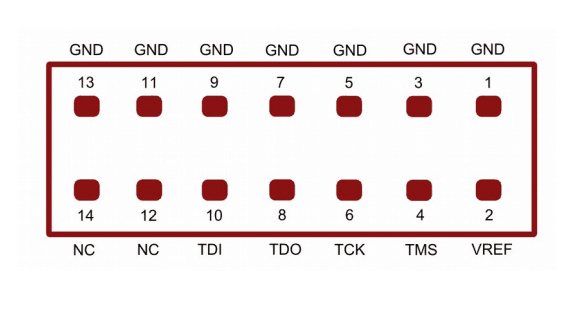 Channel A of FT2232H can be connected to the SPI bus that connects the SPI Flash chip to the FPGA or to the JTAG pins of the FPGA. By connecting SPI bus to FT2232H channel A, the SPI flash can be directly programmed to save the configuration permanently. 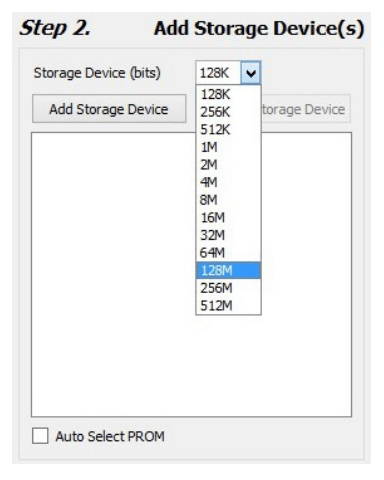 This is the default configuration set when Saturn is shipped. When FT2232H channel A is connected to SPI, Saturn Configuration Downloader utility can be used to program the board. 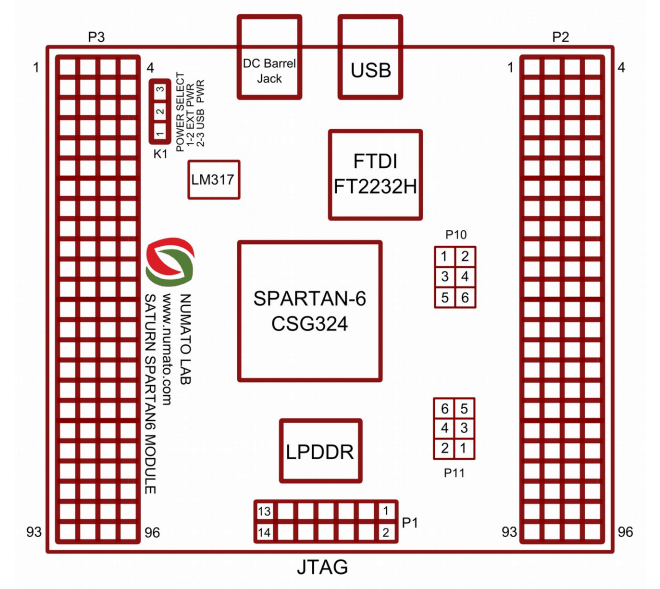 When FT2232H channel A is connected to FPGA JTAG, the JTAG signals can be accessed directly through FT2232H. 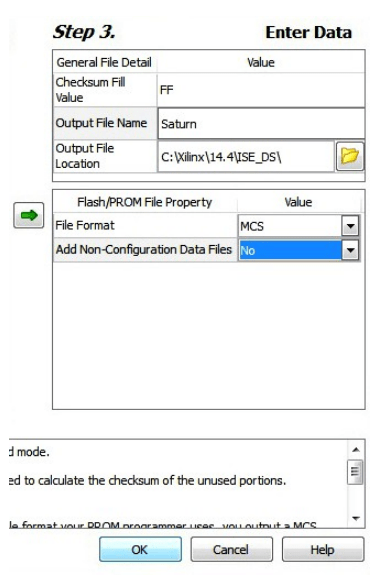 Saturn Configuration Downloader utility currently does not support programming FPGA SRAM through JTAG. Please see the tables below for information about selecting SPI or JTAG for FT2232H channel A. SPI must be selected for Saturn Configuration Downloader utility to work. This device is equipped with a maximum 158 user IO pins that can be used for various custom applications. Out of 158 user IOs 56 are length matched which can be used as differential pairs. This product requires a driver to be installed for proper functioning when used with Windows. The D2XX driver can be downloaded from http://www.ftdichip.com/Drivers/D2XX.htm. 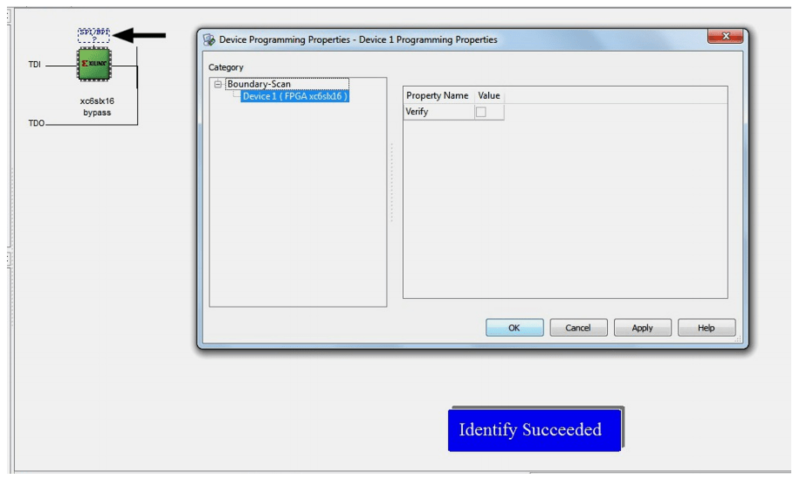 Windows Users run the CDM v2.08.30 WHQL Certified.exe application that will prompt to install the FTDI CDM drivers. 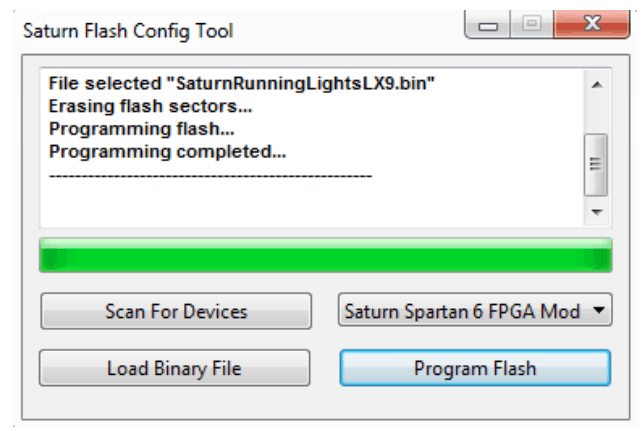 When driver installation is complete, the module should appear in Saturn Flash Config Tool as Saturn Spartan 6 FPGA Module (see the picture). HDL design needs to be converted to bit stream before it can be programmed to FPGA. Saturn at this time accepts only binary (.bin) bit stream created by XILINX ISE (http://www.xilinx.com/tools/webpack.htm). Once the HDL is synthesized, it is easy to create a binary bit stream out of it. 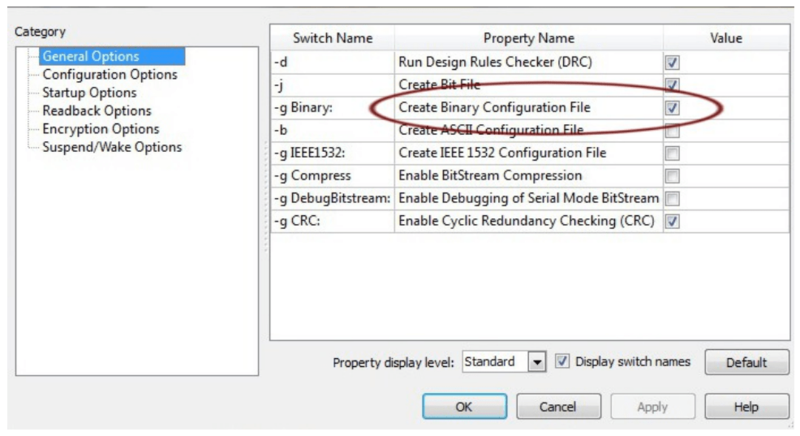 Please follow the steps below to generate binary bit stream from your design using ISE Web Pack. Step 3: Click “OK” to close the dialog box. Right click on “Generate Programming File” option again and select “Run”. Now you will be able to find a “.bin” file in the project directory and that file can be used for Saturn configuration. Saturn is factory configured to be powered directly from USB port so make sure that you are using a USB port that can power the board properly. It is recommended to connect the board directly to the PC instead using a hub. It is practically very difficult to estimate the power consumption of the board, as it depends heavily on your design and the clock used. 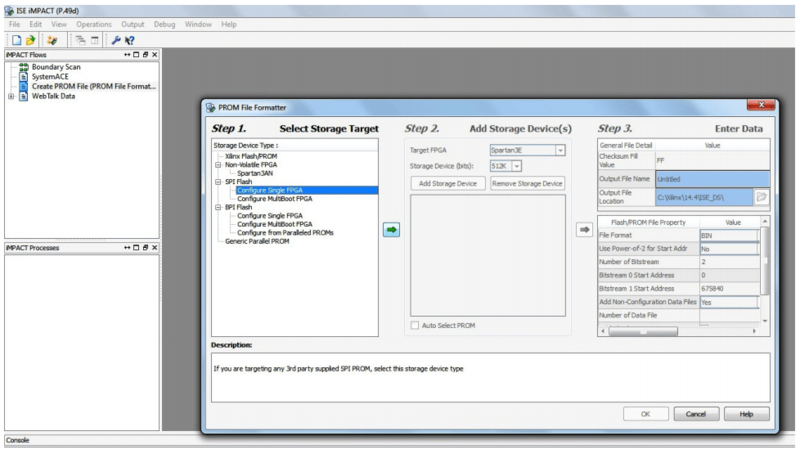 XILINX provides tools to estimate the power consumption. In any case if power from USB is not enough for your application, external supply can be applied to the board. Jumper PWRSEL should be set up properly (short pin 1-2) to use the board on external power. Saturn requires three different voltages, a 3.3V, a 1.8V supplies and a 1.3V supply. Onboard regulators derive these voltages from the USB/Ext power supply. a) Using Spartan configuration tool through USB. Saturn has an on-board FTDI FT2232 device which facilitates easy reprogramming of on-board SPI flash through USB interface. The FTDI receives bit stream from the host application and program it in to the SPI Flash and lets the FPGA boot from the flash. 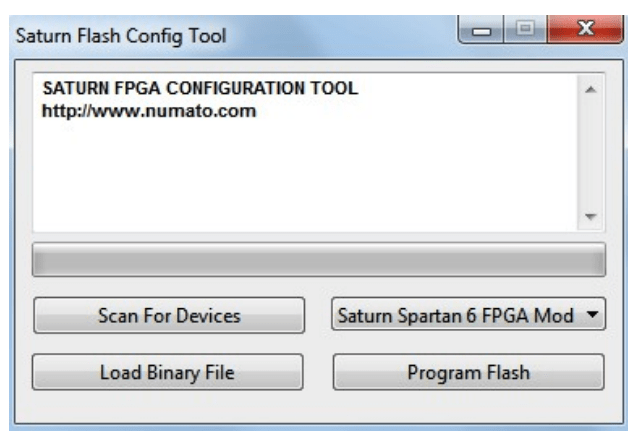 The Saturn configuration application can be downloaded from www.numato.com for free. Step 1: Open Saturn Config Tool. 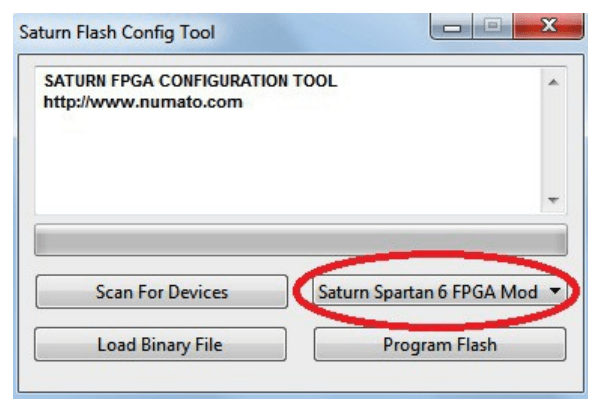 Click “Scan for Devices” if “Saturn Spartan 6 FPGA Module” is not detected automatically. 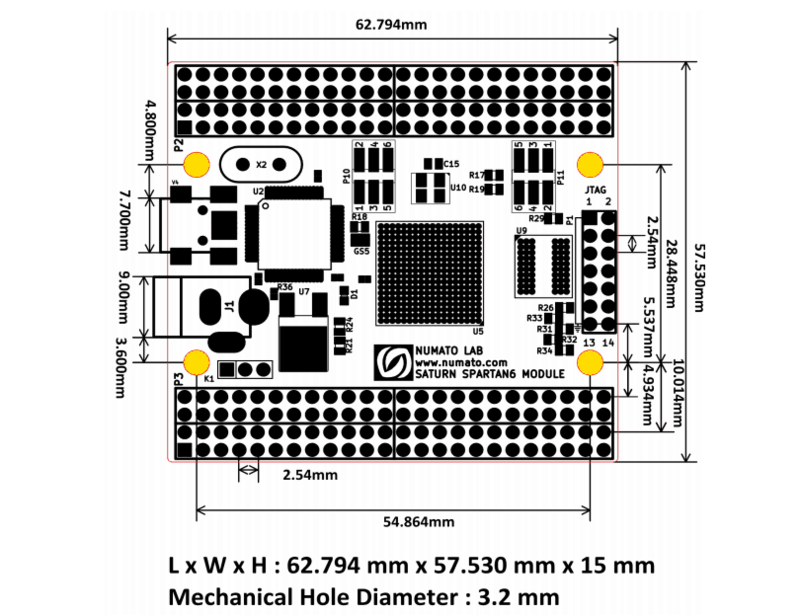 Saturn Spartan6 module features an on-board JTAG connector which facilitates easy reprogramming of SRAM and on-board SPI flash through JTAG programmer like “XILINX Platform-cable usb”. 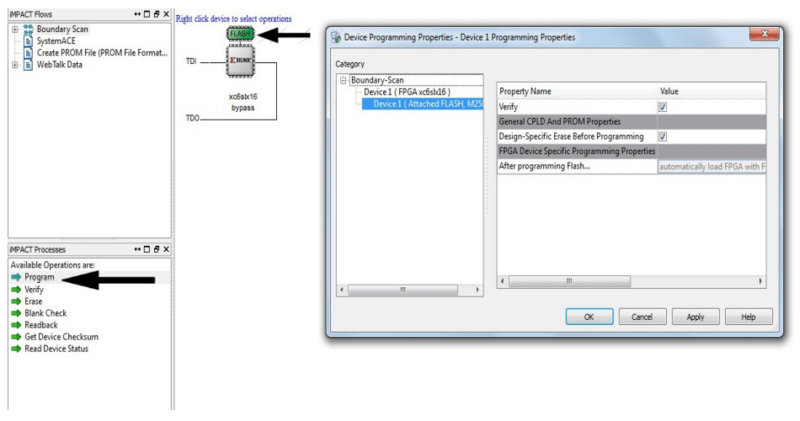 Programming Saturn using JTAG requires “XILINX ISE iMPACT” software which is bundled with XILINX ISE Design Suite. To program the SPI flash we need a “.mcs” file needs to be generated from the “.bit” file. Steps for generating “.mcs” file are as below. 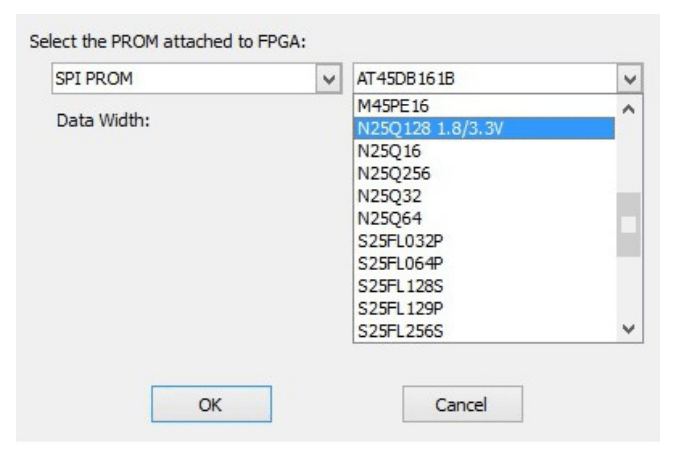 Programming FPGA SRAM does not require a “.mcs” file to be generated. 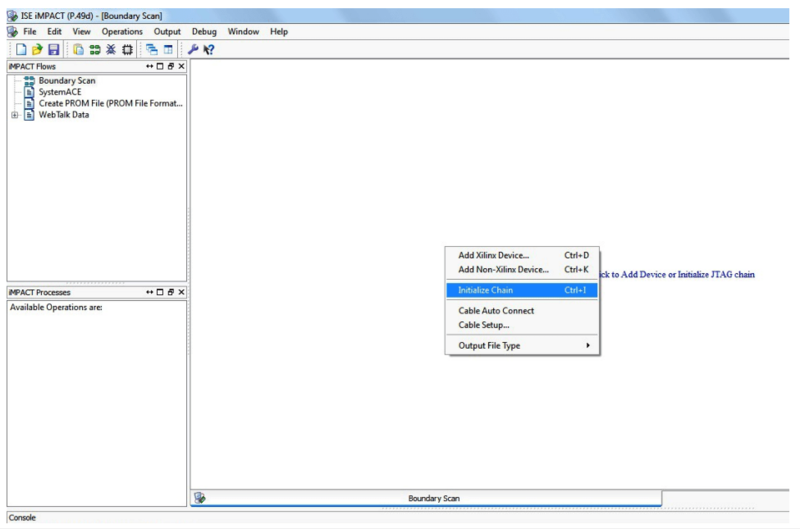 Step 4: Double click on “Generate File”. 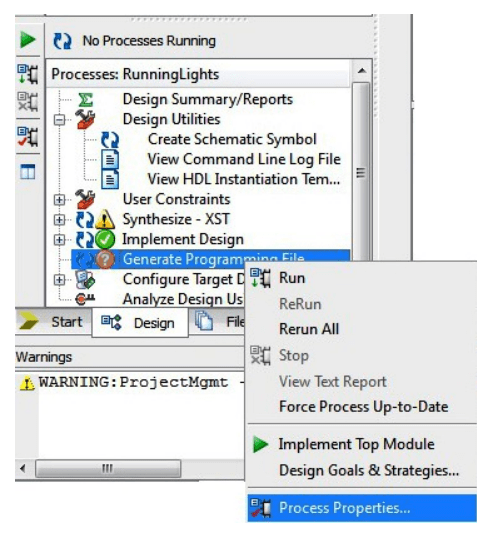 “Generate Succeeded” will be displayed as shown in fig below if the “.mcs” the file is generated successfully. Step 1: Open ISE iMPACT. Click on “Boundary Scan” in the iMPACT flows window on the left top corner. Then right click on the window panel on the right. Select “Initialize Chain”. Step 3: Select the “.mcs” file we already created and click OK. Now choose “N25Q128” in the dialogue box appeared, then click OK. This device is equipped with a maximum of 158 user IOs. Of those, 45 IO pairs are length matched which can be used as differential pairs.